I thought I would start sharing my purchases each month with you all. 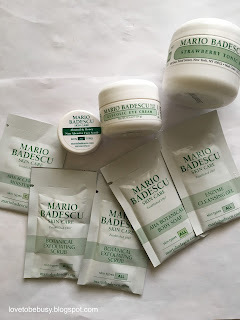 Depending on how much I have used a product or if it is a repurchase, I might have a few thoughts on if I like it or not. For the most part, it will just be what products are new to me this month. I am starting with the purchases I made in March. I had some birthday money and birthday coupons because my birthday was at the end of February. Therefore, there are more products here than I normally purchase in a month, especially makeup products. Mario Badescu sent me a birthday coupon. I really do love their skincare products and needed an eye cream for night since I am almost out of the one I am using currently. I picked up the Glycolic Eye Cream. On their website, you can complete a skincare analysis and they recommend products from their line that will work for your skin. This mask (Strawberry Tonic Mask) was one of those recommendations so I picked it up also. The rest of the items in the picture were free samples. I still had over $20 in points since it didn't go through when I was in store. I got an email with a 5x points on Tarte purchases. So I went ahead and picked up the Tarte Tease palette and the Lights, Camera, Lashes mascara I love. I used my points and earned bonus points so I paid about $10 for everything here. Birchbox sent me a birthday coupon and I had been wanting a full size of the Jouer matte moisture tint since I had a sample. So I picked up the Jouer and the Air Repair rescue balm which is a multiple repurchase for me. I use it on my cuticles and any dry patches. Birchbox was offering a free mystery box with any $50 purchase so I added that to my order as well. 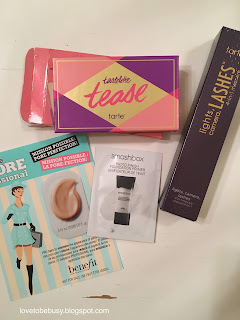 I received a Birchbox from November but it had lots of good products in it. Those included a Dr. Jart+ mask, LOC eye shadow stick, theBalm Frat Boy blush sample, Davines hair product, and Ayres body scrub. 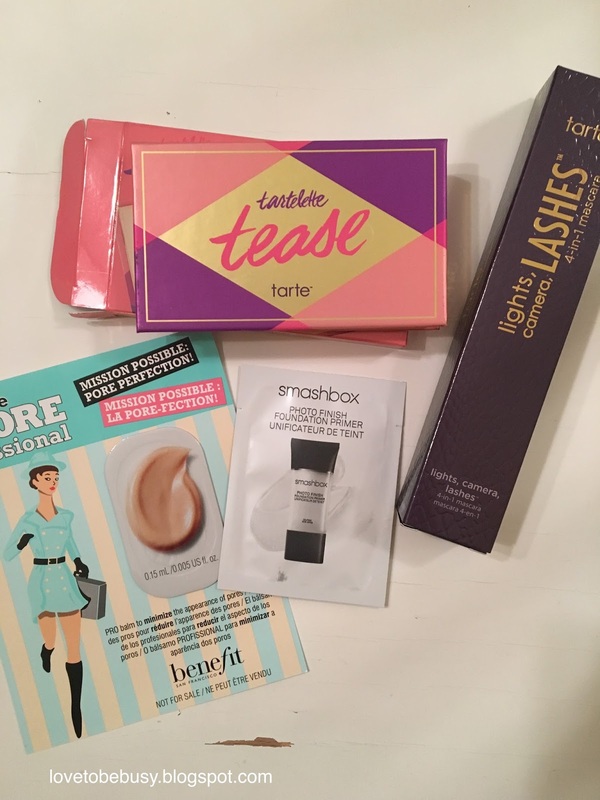 Great products for a free bonus box. That is it for March. As I said, I took advantage of birthday coupons and birthday money I had to make these purchases. Otherwise, I am trying to contain my purchases to necessities that I run out of or have no backups and am running low. Do you like these posts? 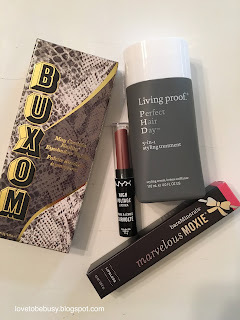 For full reviews, you'll have to watch for my empties or What I'm Loving this Month posts. I would love your thoughts. *All opinions are my own. All products shown were purchased by me. I was not compensated in any way for this post.